At Birmingham City University, we’ve been educating professionals since 1843. Our commitment to high quality teaching, innovative practise and cutting edge research ensures that Birmingham City University ranks among the best modern universities in the country. We’re investing in your future. We’re putting £260 million into our facilities to further benefit your learning. We offer over 120 postgraduate courses in subjects such as: Accounting and Finance, Acting and Theatre, Architecture and Design, Art and Design, Built Environment, Business and Management, Computing, Education and Teacher Training, Engineering, English, Fashion and Textiles, Health, Jewellery and Related Products, Law, Media and Multi-media Technology, Music, Social Sciences, Sport and Life Sciences and Visual Communication. There's no better way to find out more than to drop-in to one of our open events. Students and lecturers will be on hand to answer all of your questions and to show you around our facilities. We host subject-specific open events throughout the year. The faculty of Business, Law and Social Sciences is a globally orientated faculty, drawing on theories and practise from around the globe to inform our learning environment. 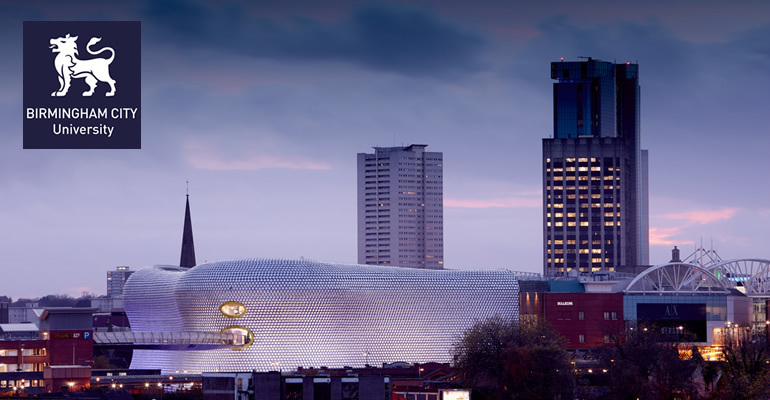 Birmingham City Business School is a leading, professionally orientated, international business school focused on connecting you with every aspect of the world of business and innovation. Birmingham City School of Law has been at the forefront of innovative law teaching for more than 40 years, specialising in social justice and access to justice, with leading academics who are experts in human rights and the death penalty, as well as civil and social justice issues. At Birmingham City School of Social Sciences our mission is to make sense of the world. Our students and academics work together across the disciplines of criminology, psychology and sociology to develop insights into society. This faculty has a national reputation for pioneering approaches to learning and teaching, through the creation of cutting edge simulated experiences and has consistently achieved ‘excellent’ ratings in national quality audits. The school of Health Sciences was established in 2014 to accommodate our growing Biomedical Sciences and Sports courses portfolio. The school aspires to be one of the largest and most diverse providers of public health education in the country. We have a good history of engagement with overseas ministries, academic institutions and professional bodies to transform local healthcare and education practises. Activities include collaborative research and delivery, student progression and mobility of staff and students. • Specialist resource room and laboratories. Birmingham City University Graduate Master’s Programmes.